Check-in time is 1 PM. All campers must register at the Office upon arrival. Check out time for all campers is 11:00 am. Ensure that your site is clean upon departure. During the camping High Season, Park gates open at 7am and close at 10pm. Maximum 4 adults (18 years and over) per site (8 people total). Children must be accompanied by a parent or guardian. One vehicle with trailer or towed vehicle permitted per campsite. Not more than one RV per campsite. If authorized, and space is available, a second vehicle may be allowed on site for an additional fee. All vehicles that will be staying beyond 10pm must have their own registration permit. All vehicles must always be parked in designated parking areas or campsites. No parking on any campground lanes, park roads or near the boat launch. No person shall drive, propel or otherwise operate an all terrain vehicle (ATV), dirt bike or recreational motorcycle. Campfires are permitted in campsite fire rings only. Fire rings must remain in place. Protect picnic tables by placing barbeques on the ground or placing aluminum foil under your camp stove or hibachi. Do not leave your campfire unattended. It is a serious offence to do so. Firewood can be purchased from the Park Operator for $8.00 per bundle or 3 bundles for $20.00, or you can bring your own. Use firewood sparingly; small fires save trees. To preserve vegetation and ground cover please do not gather branches or twigs from the area around your campsite. Check here to see if a campfire ban is in place. Potable water is only available from a tap beside the Registration Office / Store in North Park. Tap is closed from 10:00 pm to 7:00 am. No washing in lake or around standpipe or hand pump. NO RV water fill up facilities are available. Water from the handpump in South Park is not potable and should not be used for drinking or cooking. Outhouses are located within a short walk of all campsites and group sites. There is no Sani Dump Station at the park. Quiet Time is from 10:00 pm to 8:00 am. Please respect this and your fellow campers. Excessive noise is not permitted at any time. Remember that sound travels further in open air, especially music and loud talking. Generator run time is limited to a maximum of four hours per day, between the hours of 10:00 am-5:00 pm. Alcohol / cannabis consumption by persons of legal age is permitted in registered campsites only. Be considerate of your neighbours. Disturbances could result in an eviction. Please note that smoking or vaping cannabis is not permitted during smoking bans. Check here to see if a smoking ban is in place. Car-top vessels may be carried, not dragged, to and from the waterfront. Boaters must launch and remove their vessel from the designated boat launch. A $6.00 (+GST) Boat Launch Ticket must be purchased from the Park Office before launching. No person shall bring in, park, operate, launch or run ashore a personal watercraft (seadoo/jet-ski). (Bylaw No.1399 5.7(c)). Pets must always be leashed and under control, including in individual campsites. Leashes not to exceed 2m in length. No electric dog restraints are permitted in lieu of a leash. Please be responsible for your pets behaviour and properly dispose of their waste. No lifeguard service provided. Recommended swimming areas may be marked by buoys during summer season. All swimmers be advised that the lake bottom drops off precipitously close to shore and all children should be kept within arm's reach. Caution: Swimmer's Itch may be present during summer. To lower your chance of getting swimmers itch try applying waterproof sunscreen prior to swimming; rinse and/or towel-off vigorously immediately upon exiting water; and, if you are a strong swimmer, skip the shallows and swim in deeper water. The trees are a part of what makes this place beautiful. Please refrain from damaging them by placing nails, screws. Axes etc. in them. It is an offence to do so. Do not gather branches or twigs from the park. Visa, Mastercard, Travellers Cheques, cash and Quality Foods' Rec Bucks are all accepted at the Park. U.S. dollars accepted at par. GST must be added to all Park fees. Park users who have not paid a required fee will be charged double the regular rate. 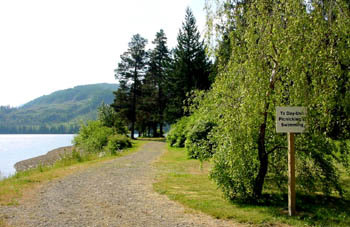 Horne Lake Regional Park is governed by RDN Park Use Regulation Bylaws 1399 and 1399.01. A Park Use Permit is required for special use of a Regional District of Nanaimo Park. Special uses include but are not limited to events, commercial recreation, filming and research. Click here to view the Park Use Permit Application Form.